Maverik Center, originally known as the E Center, is located in the Salt Lake City suburb of West Valley City and serves as a multi-purpose arena as well as the home to the Utah Grizzlies of the East Coast Hockey League. Since opening in 1997, the venue has played host to a variety of bands and artists that have come to the Salt Lake City area for concerts. Some of the highlights are as follows: Justin Bieber, Foo Fighters, Guns N’ Roses, The Black Keys, Zac Brown Band and Carrie Underwood. This spring and summer, the following bands and artists coming to the Salt Lake City area that will play the Maverik Center are as follows: One Direction on July 25 and Bruno Mars with support from Fitz and the Tantrums on August 2. Tickets for all concerts as well as all other events at Maverik Center this spring and summer can be found right here at SeatGeek. 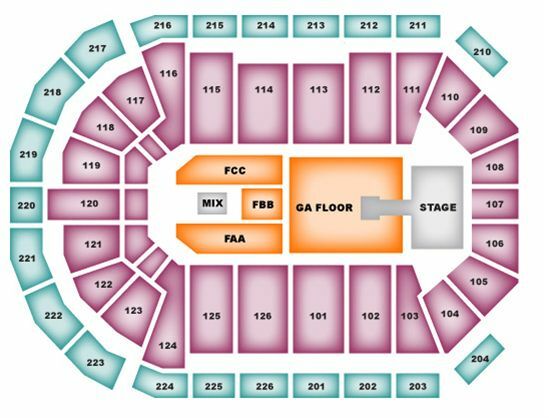 For a look at the seating chart for concerts at Maverik Center, check out the image below. The venue seats 12,000 patrons for concerts.